Starting off a whole new year always can be a basketful of emotion – including forethought and contemplative hindsight…and new, calculating, resolutions which may or may not result from the previous two. Whether you are upbeat or downbeat, I’m letting some of Peggy (of Marvel’s “Agent Carter” fame) inspire me with a dress she had on while uttering her best, most inspirational quotes. 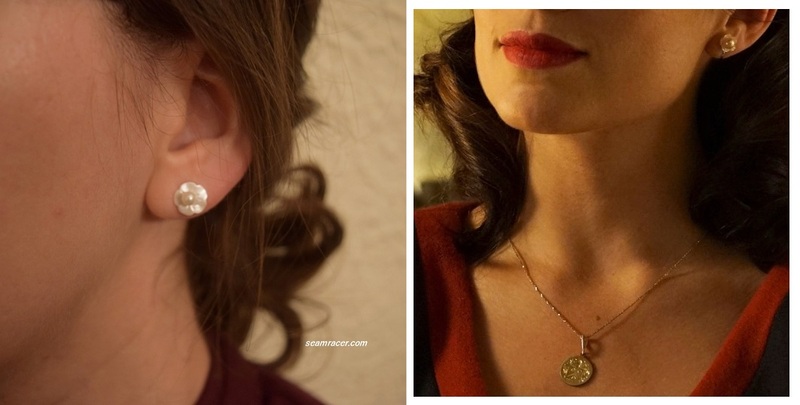 I’m including one especially in my mottos to remember for the New Year as I wear a sewn “Agent Carter” look-alike 1940s burgundy wool dress with Peggy’s trademark floral pearl earrings (also self-made). “I know my value…” is perhaps the best line Peggy is known by from Season one. This is a short, to the point one-liner which needs some potent self-confidence to pronounce properly. Knowing one’s own self-worth and humbly but proudly believing in it is invaluable. Hmmm…sewing for oneself also provides a healthy dose of self-assurance (from both the creative “high” and the new dress excitement). Thus, here’s a newly made, awesome Peggy Carter dress to help me not just “step in her shoes” but step into wearing her clothes! It’s like understanding a character on the inside by starting on the outside. 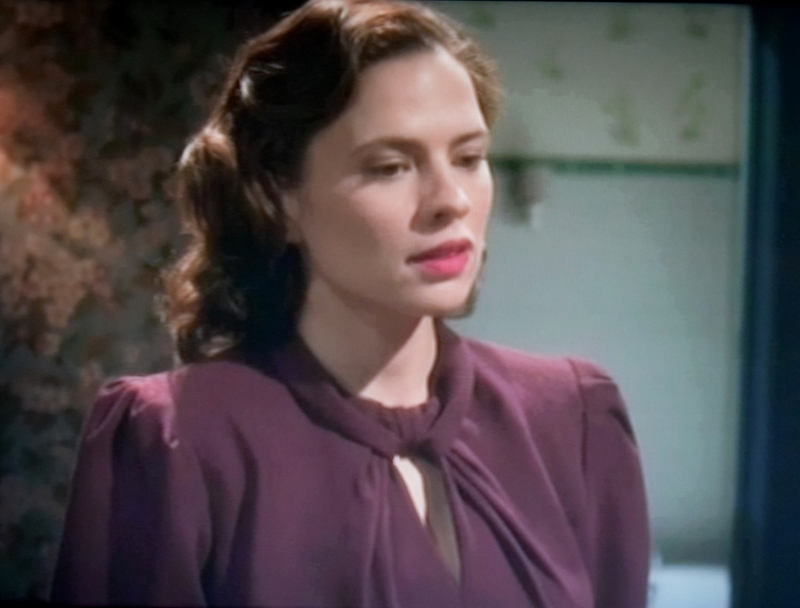 She needed to be authoritative to hold her own in the 40’s when it was primarily a man’s world, so for her undercover mission to “rescue” Steve’s (I mean, Captain America’s) blood in Season 1’s episode “The Blitzkrieg Button” she went with a strong rich sanguine colored dress. The center of her chest is tightly held together yet pulled open, like her emotions, while the rest of the dress is simple and subdued with the vintage pearl buckle and earrings giving just enough class. I adhered very closely to the inspiration dress designed by Gigi Melton, even using wool crepe, while still basing it off a mid-1940’s vintage pattern (with significant re-drafting and re-sizing). 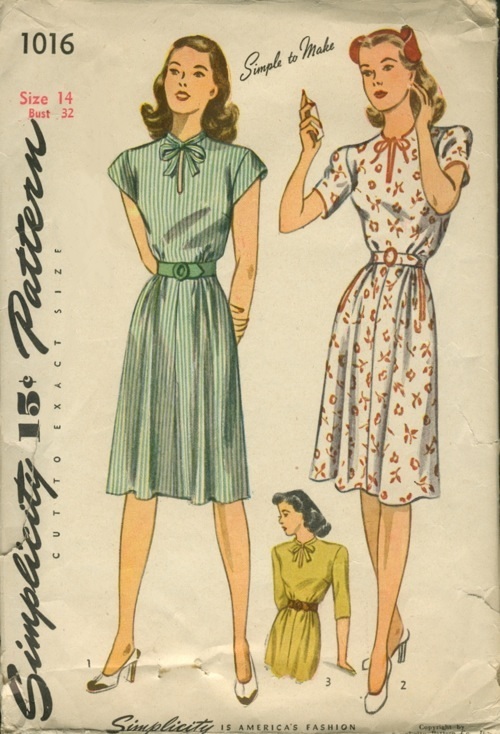 PATTERN: Simplicity #1016, year 1944. My copy is actually a Juniors’ half-size 12 pattern that I bought for cheap because of its size and because it was missing pieces. NOTIONS: I had everything I needed on hand already from awhile back, all I needed halfway through was an extra spool of thread and a zipper. The buckle is vintage carved shell. The flower backs that are put between my ear and the pearl of my earring are simply buttons (LaMode style #46455). TIME TO COMPLETE: This dress took me at least 20 hours (I stopped counting after that) over the course of a week and a half (much longer than my ‘normal’ time spent on a dress). It was finally finished on January 11, 2016. THE INSIDES: I started off with good intentions, so all the skirt seams are French. Then, I realized this project was involved, so I went to bias bound seams for all the main edges (side seams). 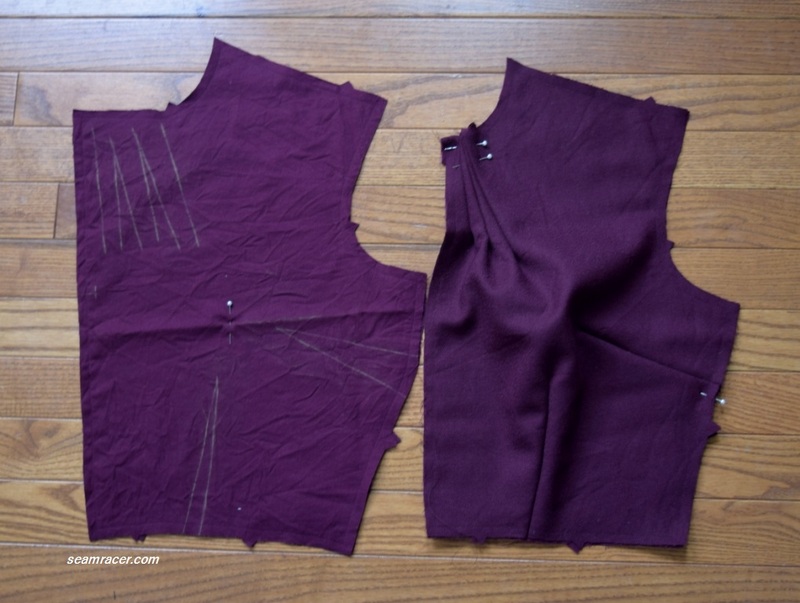 The armholes are left raw…just wanted it done enough to wear when the end was in sight! TOTAL COST: The wool was bought on clearance for dirt cheap when there was a Hancock Fabrics store closing in 2015. I believe the fabric was two or three dollars a yard – insane, right!!! This is why I got about 5 yards…enough for a dress and a vintage coat (to be made yet). The lining for the bodice was a remnant bought at Jo Ann’s Fabric for only 4 dollars. So I suppose my dress came to a total of about $10 with everything, notions included. First off, making this dress was a beastly affair, one that I wrestled with insensibly for being such a basic shape. This was a hard way for me to start off my new year of sewing. The pins keeping it together scratched me mercilessly, the seams of the lined portions were too thick, the dress kept falling off my machine into a dusty corner of the basement, and almost every dart had to be adjusted and taken in many times post-completion. This isn’t counting the unpicking (which I absolutely hate doing) plus the few times each day (between working on it) that the dress needed to be tried on just to see if my adjustments did the trick. 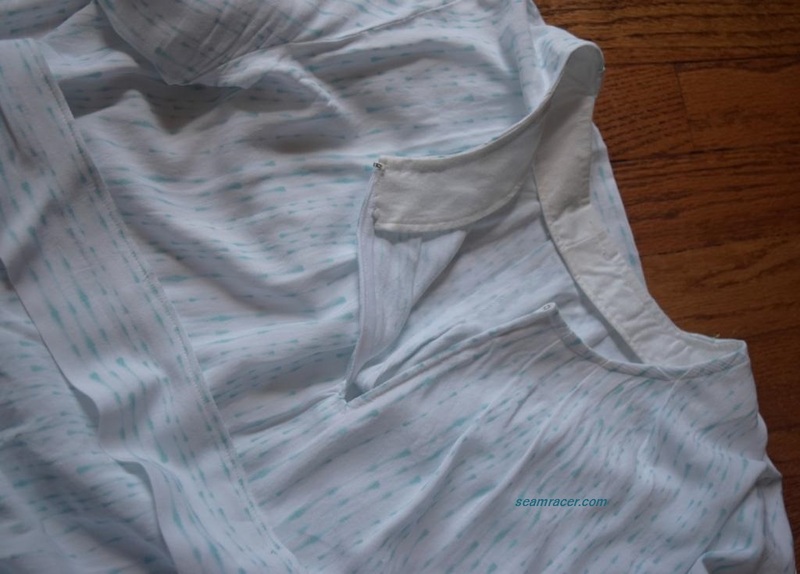 In all, it gave me trouble in every which way…all except for the neckline, which was the trickiest part as well as being the self-drafted part, and it turned out great. It figures. You know, I can take a difficult project, or even a challenging one, but one that refuses to co-operate no matter what I do is almost more than I can handle. No kidding, sometimes fabric can seem to have its own mind. Weird, huh? The wool crepe itself was great to work with, wonderfully smooth, free of itchiness, and flowing. I know, bad me – a 40’s dress out of such a fine fabric would probably not be seen in the real WWII times unless you had a stash or saved up bunches from rationing in other departments of life. 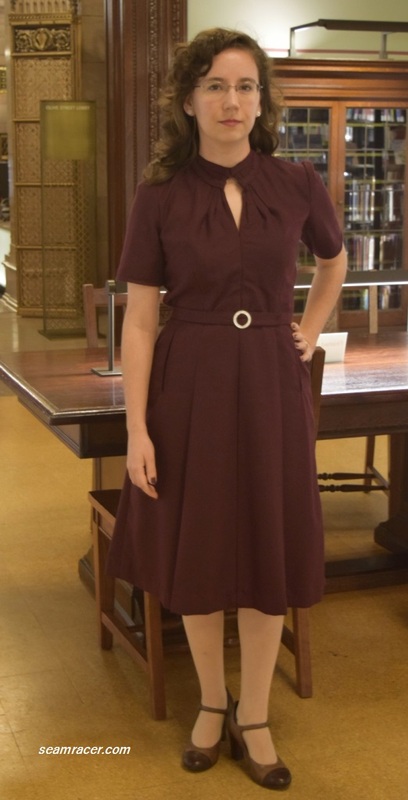 However, it was the perfect color match to Agent Carter’s original dress, besides being something I both had plenty of on hand and never sewn with before. All this is aside of the practical fact it is both soft and warm, perfect for the near freezing winter we’ve been having so far. It was very serendipitous for me to have found several points of reference to go on helping me draft, make, and base my dress on authentic history. Even finding these attributes were part of the reason I decided to go ahead and make this dress (which had been on the “back burner” of my mind since Season 1 in 2015). I figured I had enough help and ideas to go on and another Agent Carter dress is always a good thing for me to have – so why not?! Please visit my Pinterest board of inspiration for this dress to see the patterns and pictures that motivated me. This dress might not be “up there” as one of my awesome creations, but to me it has all the best that the 1940s has to offer for modern wearing. It has simplicity of style enough (especially the back view) to be classic and not too obviously vintage, like some 30’s or 20’s fashions. It also has practicality with the sneaky low-key pockets, ease of movement front pleats, basic short sleeves, and high neck for both warmth and demureness. Yet, there is a subtle alluring factor keeping the dress so feminine – the low slashed front opening with interesting pleating. I think the floral of the earrings and the pearl of them and the buckle breaks things up (besides dressing things up) just enough, with the rich deep color and different finish of the fabric lending a richness. Not meaning to toot my own horn here too much, but, hey – I guess it shows how much I really like this dress! All that effort was worth it for me to end up with something like this. As the base for my dress, I was looking for a very basic mid-WWII pattern with a high neck that had a tie. I found it in Simplicity #1016 and my first step was to trace out a copy on sheer medical paper then hack, resize and adapt it. Being a teen size, I added a swath of horizontal 2 inches above the bust, under the chest, right at the level of the bottom of the armhole to bring the bust, waist, and hips down to the right proportions. This sort of adjustment has always worked before when I’ve re-sized Juniors’ patterns from the 60’s and 70’s, and it worked this time for the 40’s too! Then I added in an overall 4 inches to be on the safe side since it was for a tiny size. As I was working with a copy, I had leeway to add in the inches properly, vertically across in increments and not just on the center or on the side seams. I believe my problems with fitting came merely from the pattern running large and me not completely accounting for the extra room coming from the front details. The junior-to-adult change was right on. Finally, I re-drafted to add in the pleats. 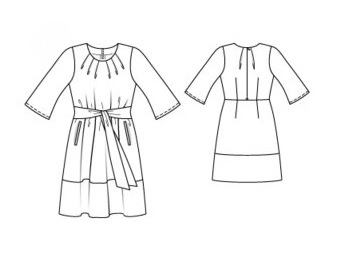 The inspiration dress had ties pulling the chest opening open, sort of like ties on curtains, but I wanted something sewn in place to give the same immovable illusion so I drafted slanted, sun-ray-style, open pleats underneath. I had done similar pleats when I made my 1940s dance dress, Simplicity #1587 (posted here), in a different direction but I just studied how it was drafted and turned it around (like figuring out a puzzle piece) to see how it would work in a different angle. Then I chose how wide I wanted the darts, how far apart, and how long then slashed and taped accordingly. Looking at the envelope backs of my inspiration patterns also helped justify that I was on the right track. When it finally came to stitching the front bodice together, it was an awesome moment when I realized that not only did my drafting work but sewing is like working on a flat plane yet seeing through it to create in 3-D. Sewing is really so insanely awe-inspiring…some times more than others make me perceive so much. The neckline ties were still sewn on as the pattern originally planned, except I folded them in, tacked them down, then brought them back out from inside to form the band that seems to ‘pull back’ the pleats along the chest opening. It was almost more hand sewing than I could handle invisibly stitching the tie strips in place arching upwards along the neckline. 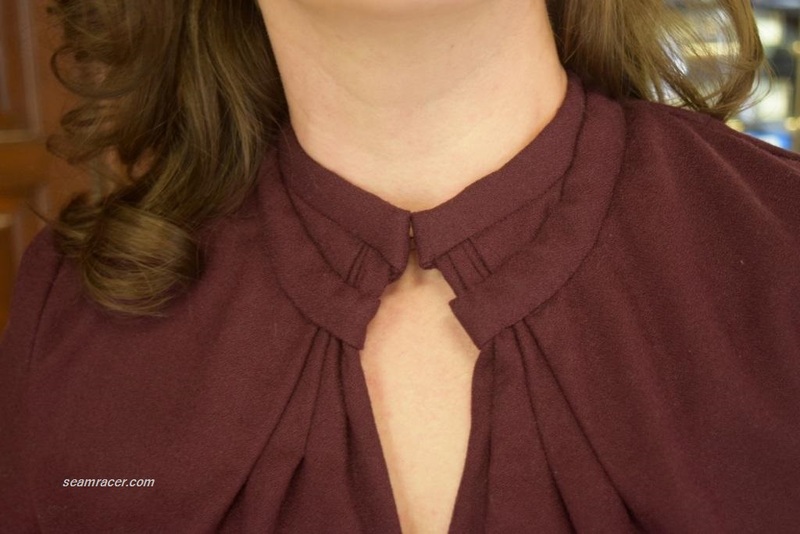 The tie strips wrap around to end lapped over one another at the back neckline. 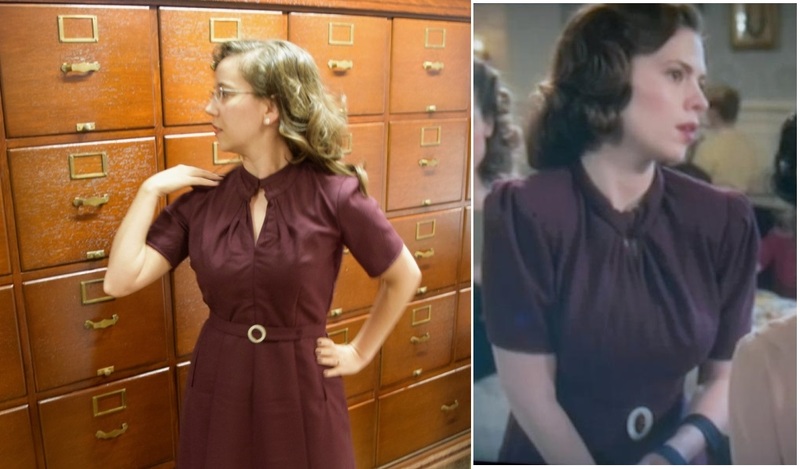 Agent Carter’s original dress has a full back zipper as the method of closure – seen in a fleeting screen shot when she hangs up her coat in the S.S.R. office (on the episode “Blitzkrieg Button”). Now, I hate to criticize full back zippers in 40’s dresses because I’ll confess to having sewn them in some of my own garments, besides the fact that the original dress by Gigi Melton is too lovely to find fault with. However, with all the fine details to my dress (much hand sewing, wool crepe fabric, etc. ), I wanted to go all out authentic 40’s and have only the side zipper in conjunction with a working front closure in the neckline details. Ugh, was it tough to figure but there is a hidden hook-and-eye where the neckline meets. Now, besides the front neckline, I also changed up the pattern a bit more by eliminating all the small gathers and sewing darts in the same place instead, both above and below at the waist in the skirt and in the bodice. 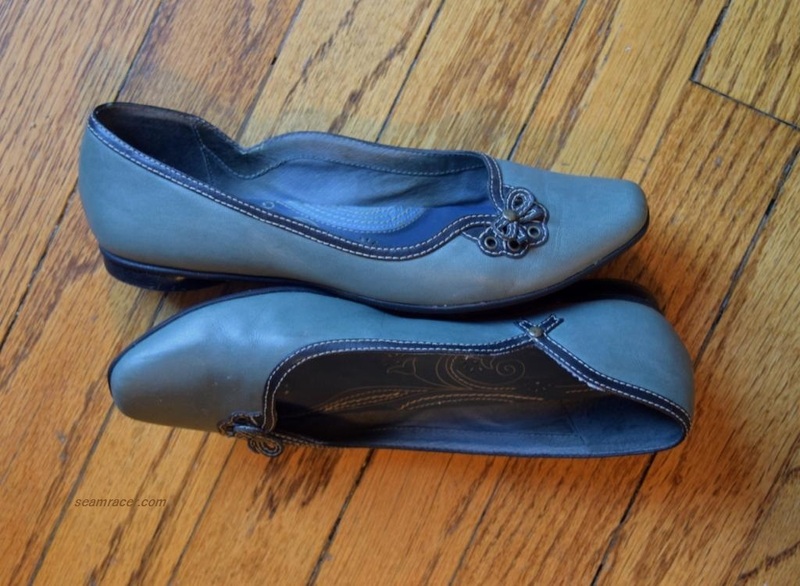 This smoothes out the silhouette and makes it simple and unfussy, like Agent Carter’s dress. This was not a problem anywhere else but in the skirt front. I made darts at first, but after the rest of the dress was done, I went and made two knife pleats in the front instead. These type of pleats in the front of skirts and dresses were used more in the early 40’s before rationing started being enforced, but these are only two in number and not very deep so these are a plausible effect to a 1944 design – the pleats also compliment the neckline! At first, I considered leaving out the pockets, but they are discreetly unnoticeable on this dress and always so handy! 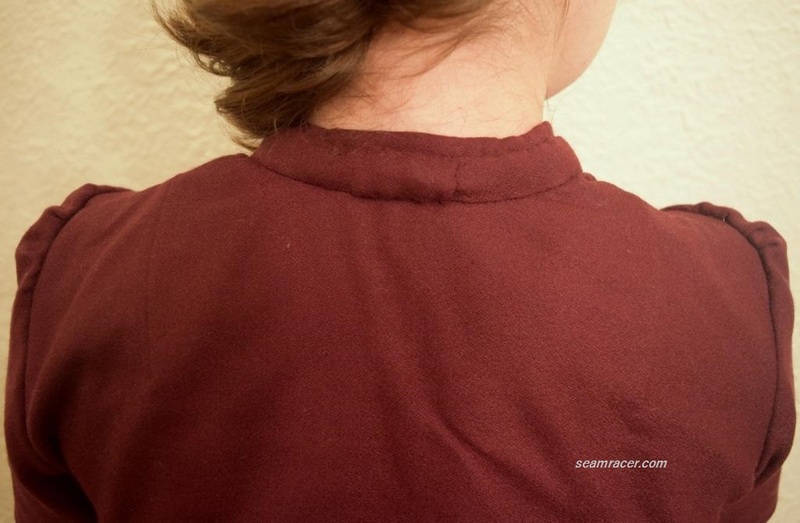 They were sewn as if in a really basic welt pocket method and yet sort of like a facing – right sides together, sewn in a small loop, slashed and turned in to the wrong side. Then half of the entire pocket was sewn to itself and turned towards the middle. Easy! I’ve never seen pockets like this yet. They’re not hidden by some clever trick or made to look like part of the design, just basic and practical. I love the 1940s! What I don’t love about the 40s is the harsh facts of the bloodier side to the decade, like the Blitz that the dress I made is remotely associated with. England endured the Blitz admirably. Germany, late in the Blitz, began to start dropping some its very successful heavy high explosive bombs, showing their aptitude for forward thinking inventions. Both sides came after each other hard with the best of what they had – and sadly many people suffered in between. Peggy’s dress and my blog title is not trying to be flippant about the blitz or England. On the contrary – just as what happens in Peggy’s ‘life’ when she wears this dress, much of history is sad, powerful, and full of emotion but good nevertheless to learn of and re-visit at times. Fashion is intertwined with history…the combo of a dress just as strong as the woman who wears it can do big things. Every woman could do with a little bit o’ Peggy in their life – it’s lovely. I’m going to miss not having a Season 3 of “Agent Carter” this 2017. She might not be relevant for this year but her message and persona is always appropriate. We need non-super-power, down to earth, heroes like Peggy, one who can help you with her own attitude and outlook not just someone up on a pedestal, unattainable. “I know my value…anyone else’s opinion really doesn’t matter.” It was an attitude like this that got Britain through the awful Blitzkrieg. It is always important and supremely empowering to believe with Peggy you do not need the world’s support to see yourself as awesome and capable. Thank you, Agent Carter, for the reminder.